This award, established by resolution of the Board of Directors on January 4, 1994, recognized the significant contribution made by Paul Keough and is awarded to an organization or individual for outstanding leadership in government. Paul Keough (1946-1994) was one of the first employees hired at the EPA Boston office when it opened in 1971 and served the agency for over twenty years, earning accolades as a hard-nosed, energetic bureaucrat with an abiding commitment to the environment. Mr. Keough began at the EPA as the agency’s press secretary and spent over 10 years as the deputy administrator for New England. Mr. Keough had an enormous impact on the hundreds of EPA employees he worked with in the Region 1 office. He also had a major impact on the thousands of individuals from business and industry, New England’s many environmental organizations, and other federal, state and local government officials with whom he came in contact. 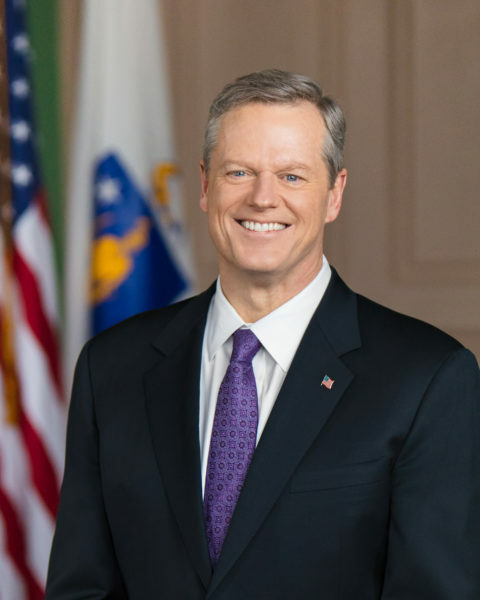 Governor Charlie Baker was sworn in for a second term as the 72nd Governor of the Commonwealth of Massachusetts on January 3, 2019, after a first term focused on moving Massachusetts forward through bipartisan, results-driven leadership. Confronted with the challenges of rising energy costs and a changing climate, Governor Baker has taken nation-leading steps to diversify the Commonwealth’s energy portfolio, safeguard residents, municipalities and businesses from the impacts of climate change, and secure progress toward greenhouse gas reduction targets. Governor Baker has used public private partnerships to spur economic development, reformed the state’s regulatory environment, and delivered critical tax relief by doubling the Earned Income Tax Credit. Ensuring Massachusetts continues to be a national leader in education, Governor Baker has made historic investments in K-12 education, increased support for vocational and technical schools, and expanded early college opportunities for high school students. Governor Baker has put Massachusetts at the forefront of fighting the opioid and heroin epidemic, doubling spending on prevention, education, treatment, and recovery and signing two major bills that have served as models for other states. Governor Baker has spearheaded long overdue reforms at the MBTA that have led to significant improvements to operations and finances, and put the T on track to spend more than $8 billion on infrastructure over the next five years to improve riders’ experience. Prior to his election, Governor Baker was a highly successful leader of complex business and government organizations, serving as a cabinet secretary to both Governor William Weld and Paul Cellucci, and leading Harvard Pilgrim Health Care, as CEO, from the brink of bankruptcy to one of the nation’s highest ranked health care providers. Raised in Needham, Governor Baker and his wife Lauren reside in Swampscott, and are the proud parents of their three children, Charlie, AJ, and Caroline.